We were lucky to squeeze in one final fall science experiment before our trees lost all their leaves. We took a few minutes one morning to walk around the yard and find leaves in red, orange, yellow, and green; just picking a few of each. We wanted leaves fresh from the trees because we knew they would work better. We sorted the leaves by color and broke them up into tiny pieces; placing each color in their own jar. 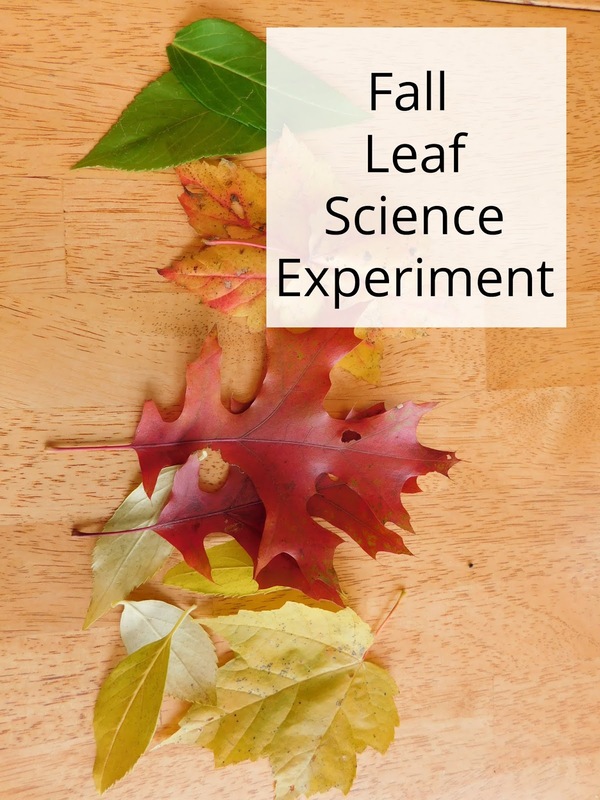 We then took a spoon and used the flat side to crush the leaves; trying to release some of the color before we added some rubbing alcohol to each jar. We added just enough rubbing alcohol to cover our leaves and then put a lid on them (cling wrap would work great too). We then put the glass jars in a larger pan and added HOT water to the outer pan. Basically we wanted to warm up the alcohol to help speed up the process of drawing out the various chemicals that make the leaves the colors they appear. We set it aside on the counter for a few hours and let the water cool off completely. We then removed the lids and made sure we had colored alcohol puddles. (If we didn't I would have added another batch of water and let them sit overnight). We then cut up strips of coffee filter and put one strip in each jar. After just an hour or so we could see the colors being drawn up. We left them sitting overnight so we would see a more dramatic effect the next day. When our papers dried they looked like this! We talked about how leaves always have all of these chemicals inside them but the green (chlorophyll) overtakes the leaves in spring and summer because the plant is busy making lots and lots of food. In the fall the plant isn't working on food production and the other colors become visible. Thank you! I bet it would work as long as the leaves don't get too dried out in transport.